Panda Internet Security is a comprehensive security suite that protects system from viruses, spyware, trojans, spam, rootkits, hackers, online fraud, identity theft and all other Internet threats. The new Panda Internet Security 2010 comes with user-friendly interface and effective protection against Internet threats with minimum impact on PC performance. In addition, it also comes with SmartClean technology, TruPrevent Technologies 2.0 and ultrafast scan engine which is 30% faster than its predecessors. On the other hand, Panda Internet Security can also automatically analyze and classify thousands of new malware samples per day. 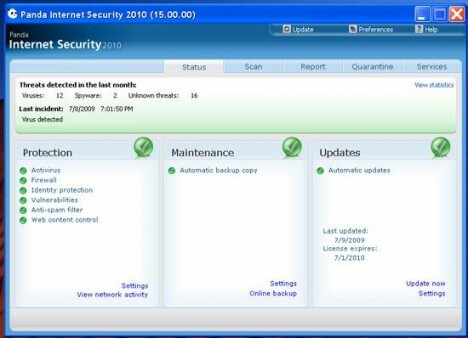 Panda Internet Security 2010 has improved and updated cutting-edge virus-scanning techniques, USB protection system, antirootkit techniques, antiphishing heuristics, and faster scans (even while multitasking). Panda Internet Security 2010 (aff) normally cost $59.95. Panda Security is available in more than 23 languages and millions of users located in 195 countries around the world. As part of promotional offer from Web of Trust (WOT), in partnership with Panda Security, Panda Security is giving Panda Internet Security 2010 to all WOT members for three months for free. Or use direct download links below to download and install the free three months subscription validity Panda Internet Security 2010. Update: Offer expired and reverted to 1 month free trial. Check out Panda Internet Security 2010 free 1 year license.